Last week, I was invited to join a handful of other media guests for a hands-on experience with Fresh Canteen’s new ready-to-cook meal-in-a-box service. I’ve been intrigued by Fresh Canteen’s approach to meal prep since they launched and Matt brought them to my attention as an interesting food startup. “Fresh Canteen, a new Toronto-based start up, looks to satisfy the cooking and hunger pangs of time-crunched, shopportunity-deprived urbanites with a unique concept that delivers ingredients and a healthy dab of chef-inspired pride direct to customers’ kitchens. There are many “ready to eat”, “heat and eat”, and “assemble and eat” options for people who are pressed for time, too overbooked to get to the grocery store, or simply too tired to think up yet another meal. Fresh Canteen has taken a unique approach for Toronto and so I’ve been watching them from the sidelines to see how they develop. Business aside, I’ve also been jonesing to try their service, so when the invite came in I was a definite “yes”! I was excited to try cooking one of their recipes and check out the experience of having everything I needed to cook a meal in one box. We were all set up with a cooking station and handed a Fresh Canteen box, just like the ones Fresh Canteen delivers to households all over Toronto every Tuesday. After sampling a couple of Fresh Canteen’s other recipes served up as appetizers – loved the lamb korma and the others were good too – we were invited to open our boxes and start cooking. Inside the box was an insulated bag stuffed with a recipe, ice packs and all the ingredients we needed to make, in this case, seared duck breast with garam masala and sauteed grapes. I was impressed that this was one of the Fresh Canteen recipes you can order. I didn’t expect the dishes to be this high end. 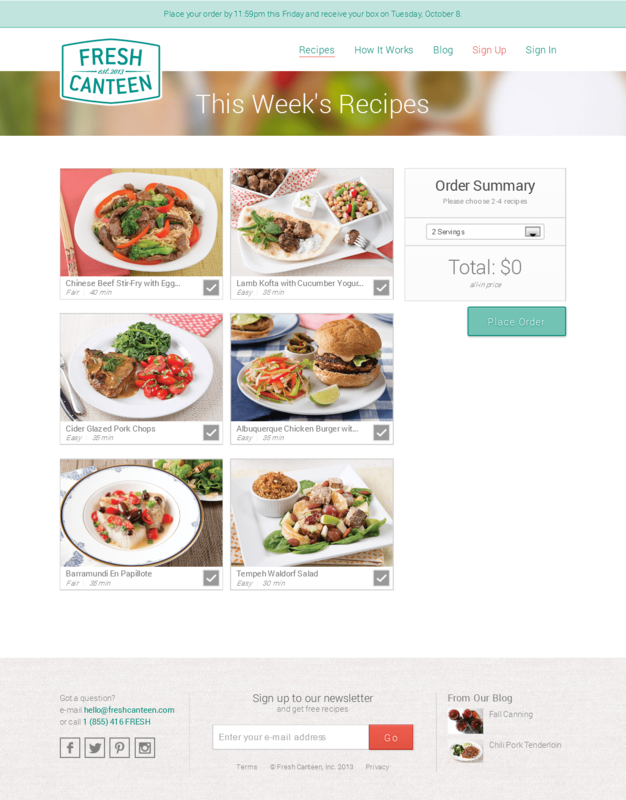 3 new recipes are offered each week, and each recipe is available for 2 weeks. Our feature menu item this week is the Red Thai Beef Curry, The fragrance alone of this curry will get your taste buds jumpin’! And when you taste the richness of the flavours you’ll have a hard time believing how easy it was to prepare. In fact, you’ll probably never do takeout again! Bonus: one of the main ingredients in our curry is coconut milk. The saturated fat in coconut is made up of short-chain and medium-chain fatty acids the body quickly turns into energy instead of storing as fat. Therefore, even though it’s high in saturated fat, coconut can aid in weight loss. 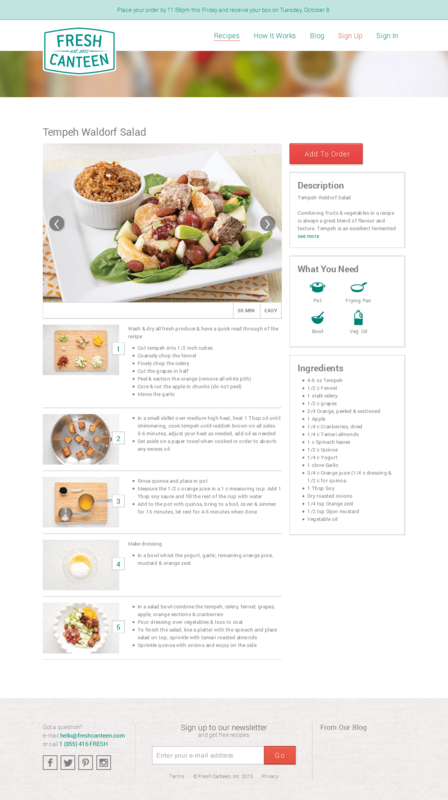 You can order 2 to 4 recipes, and pick whether you’re cooking for 2 or 4. Then you just sit back (or more likely get back to work) as Fresh Canteen shops for you, portions out the ingredients for each recipes, packs up each recipe box and delivers it all to you. As long as you get your order in by end of day Friday, you’ll get boxes Tuesday. All you have to do is crack open the box and follow the recipe step by step. While we didn’t select the recipe ourselves, I couldn’t have been happier when we cracked open our Fresh Canteen boxes and hauled out the recipe card. DUCK! Seared Duck Breast with Garam Masala and Sauteed Grapes! I love duck, I love garam masala, and I love grapes. The ingredients were almost exactly what you need for the recipe. You don’t need much more than salt & pepper, a knife, a stove, and some pots and pans, to turn out dinner. The recipe card included a difficulty rating: medium for this dish, which seemed about right; and estimated time: 35 minutes. Again, about right for this. And step-by-step instructions which guide you through the cooking. There is also basic nutrition information – calories, carbs, fat & protein info. Even a support line number, you know, just in case. The ingredients were portioned out for the recipes, with a little extra. There were extra grapes (not a problem, I snacked and used them for garnish), and a little extra in each of the spice packets, so you do need to measure, since they give you a bit more than you need just to be safe. I used all the garam masala on the duck and I adding a little extra cinnamon to the sauteed grapes too. The ingredients are good quality and produce big servings. The two plates in the photo below were from the food in one 2-serving duck recipes box. It ended up being enough food for 2 dinners and a good sized lunch. The thing I like most about Fresh Canteen’s approach of providing you the ingredients and recipe, and letting you work your own magic is that you can tweak as you go. Don’t like that much salt? Use less. Want things a bit spicier? Throw in a handful of chili flakes. Don’t eat mayo, use the yogurt from your fridge instead. For someone like me who rarely follows a recipe, this is fantastic. I skipped the mayo entirely in the salad dressing recipe. If you don’t cook much, you can learn some new techniques that you can use even when you aren’t following their recipes. And you can try new flavours without getting left with a whole lot of an ingredient you may never use again. While I like having a big bottle of fish sauce on hand, I suspect some kitchens have a bottle sitting in the fridge from that one time they tried making Thai food from scratch. How Much Does Fresh Canteen Cost? I had a couple of people ask me about the value after seeing that I had attended the media event, so I’m going to crunch some numbers for you. The ordering system allows you to order between 2 and 4 recipes whether you are serving 2 or 4. No matter how you do it, the first 4 servings are the most expensive at $60 (or $30 for 2.) After that each recipe is either $20 for 2 or $40 for 4. Essentially it means each individual Fresh Canteen serving costs between $11.50-15 depending on how many you order. If you are comparing this to shopping, prepping and cooking for yourself, Fresh Canteen is definitely pricier. However, if you are comparing this to working a long day, coming home to realize you both forgot to do the grocery shopping, again. Then ordering in, again. (Or just heading out for a restaurant meal, even a CheapEat). Fresh Canteen is a pretty good deal. And for those of you who actually read all the way down here, a bonus! Take $30 off your first order and given them a try by using promo code “FALL30” at checkout before Friday. That’s an entire dinner for 2 for free! I think Fresh Canteen is a great idea. There have been many times in my life when time was at a premium and I was regularly eating crap. Fresh Canteen would have been a godsend for me. For a busy couple, or even family, I can see ordering 2 recipes for those crazy weeks when getting the shopping done is a real challenge. Or to keep the kids from ordering yet another pizza for dinner when you are working late. Many of the recipes look perfect for kids to start learning how to feed themselves (or even you). I’m eager to see how Fresh Canteen grows and develops as a startup, to see the recipes they roll out and I expect they’ll be delivering to my house too. Oh and did I mention I had a lot of fun cooking and that the duck breast was excellent? It was excellent. it is indeed a challenge to my darling’s pallet amused at times… ok, most of the time. it does make for a never ending stream of new dishes and food experiments tho, so i really have nothing to complain about. Andrea Toole did you get the Duck recipe box or the mock-butter chicken for your mashup?